Many people give up on budgeting because they think it is difficult or complicated. But flying by the seat of your pants not knowing what your finances are is scarier. Stitting down and figuring out what your income and expenses are can and should be done. It boils down to creating a system that works for you and that you can do easily and stick with it. Budgeting is a hot topic right now and, if you want a house, car, or even a vacation home, you’ll need to get your finances under control. Getting mine under control means I will be paying off my home super fast. To get mine under control, I researched and I have my tried and true budget hacks that can be easily implemented, even for those on limited incomes. It’s even more important for those of you on slim incomes to prepare for the unexpected. Give them a try and get your finances under control. Don’t live beyond your means. Spending on what you need versus wants. Spend less than what you earn, limit credit use and cut back on unessentials like cable, etc. It’ll be easier to save once your curb your spending. Preplan your meals for the week and shop once. Buy in bulk (think warehouse stores like Sams Club, BJs or Costco) and pack a family sized meal in a bag. Plan meals even for busy nights (programmed crock pots are great for busy nights) to avoid expensive and unhealthy meals. Take lunches to work or school. Avoid buying junk foods. If you need ideas, check out Pinterest for meal and crock pot ideas. There are also some really great pins on budget or cheap meals and budgeting meals (for example, spending under $150 a week for a family). Credit card usage tends to get people in trouble. It’s hard to refrain from spending when the card is in your wallet and you see something you want (again wants vs. needs). Using cash makes you more concious of whaat you are spending and what is left. I’ll be honest, when I had more corporate job, we were eating out, over buying and attempting to keep up (outspend) with Joneses. I did a life overhaul and embrace simplicity. I gave up most personal belongings (yes, even a car!) and even took on a career in a completely different direction to embrace a simpler life. Now it’s time for you to stop keeping up with others and stop living beyond your means. Utilities are a huge and unavaoidable part of your expenses. There are ways to cut these costs down. Unplug unused electronics, adjust your thermostat (mine is on 78) and change your filters, wait until the dishwasher is full to run, etc. These are just a few ideas to start you off. Think of what ways you can incorporate and save even more. Let me know what you think of as I may need to do so as well! Avoid impulse buying and refain from unnecessary purchases. If it is something you feel you just cannot live without, give yourself time to think about it and see if your desire to have it dies down. There are some great budgeting apps that can assist you with your budget and tend to make it easier. Simply download a selected app onto your smart phone, and enter expenses and income. Let the app help you get a handle on tracking your expenses. Many of the apps will keep track of deposits, expenses, and even investments. Dining out, movies, concerts and other actvities are pricey and add up. Rethink getting out and be creative. Go on a picnic, go on a hike, etc. Or stay in and have a game night, a bbq, a movie night (at home). Look up your community and see if there are free activities in your area. I know our aquarium has a free day on Tuesdays. You can even have friends over on a budget. How about a game night? Make it fun! You can even grab prizes at the dollar store. If you don’t already follow Dave Ramsey, you need to start. There are several savings he suggests starting, one of which is an emergency fund. Like I said, even if you are on a slim income, it is just as important for you to have an emergency fund. Follow the emergency fund guide and set aside the money your budget will allow, each paycheck. Once you start and you are consistent, it gets easier. Being prepared for the unexpected is important. Check out Dave’s Youtube show as well. It’s great! I understand implementing a budget is overwhelming, but getting started will be the best thing you ever did for your family. 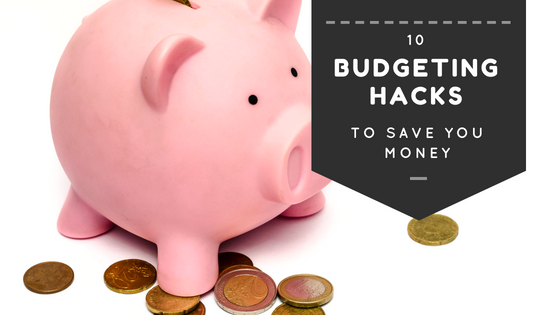 I’ve provided you with some easy budget tips and hack to get you started on that budget. Start applying them today to change your situation. If you have any questions or a tip I missed, comment. I’d love to hear from you!